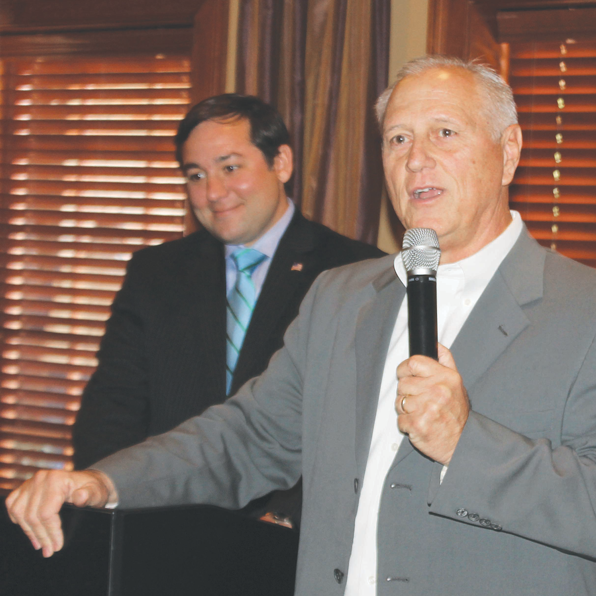 BATON ROUGE — Leaders of the effort to create the new Southeast Baton Rouge Community School System came out swinging at last week’s Ronald Reagan Newsmaker Luncheon. They announced they’ll introduce bills in the April 8 legislative session to place the proposed new independent school district on the statewide ballot. But they also hit back at critics, especially the East Baton Rouge Parish School Board. Lionel Rainey III of Local Schools for Local Children said the only arguments being used against the new school system were false. Rainey says the first argument is that the Southeast district would “resegregate” the East Baton Rouge system and cater to whites. Rainey said nothing could be further from the truth. “The truth is, East Baton Rouge is a segregated system with 85 percent African American. The new Southeast district will be the most diverse in the parish. Even if every student attending Catholic system entered the new system, it would still be 54 percent African American,” he said. The second argument is legacy costs and that too is bogus, Rainey said. Legacy costs refer not to retirement benefits, which are covered by the state, but rather to health insurance for retired teachers. Rainey said the new Southeast district would cover the entire health insurance cost of every teacher who retired from the new system, even if they were there only one year. He said the system would also dedicate $2.5 million toward the health benefits of EBR teachers who formerly taught in the Southeast area, even though they have always been EBR employees. “It’s a shame to see small children standing on the side of the road at 5:30 a.m., waiting for a bus to take them to some far distant part of the parish. Just let the people vote, and they will speak on this,” Browning said. The legislation, which is expected to be introduced by Sen. Bodi White, would call for a statewide constitutional amendment to create the Southeast Baton Rouge school district. It would have to pass statewide and in East Baton Rouge. Browning said first year enrollment in the new school district should be around 7,100 students, and the system should have revenues of about $65 million. He said he expects student costs to be about $8,500 a year — far below the cost in East Baton Rouge. The new system is modeled to a large degree after the Zachary and Central school systems. Zachary broke away from EBR in 2002 and has consistently been the No. 1 school system in Louisiana. Enrollment in Zachary is 54 percent white. The Central school system was created in 2007 and it is currently ranked No. 5 in the state. If passed by the legislature and approved by the voters, the new school board would have nine members. The initial school board would be appointed by the governor. Within the first year, a special election would be held to elect board members for the remainder of the term. Browning said leaders of the new system have been working on adoption of a curriculum. He said they have also addressed issues involving gifted and talented students and special needs. Rainey said one major difference between the Southeast school system and the existing EBR system is that the new system won’t be top-heavy. “Ask any teacher or principal in EBR how hard it is to make changes. EBR is a maze, and a decision takes forever to get to the top. The advantage of a smaller system is that decisions are made quickly.